Do you want to updates of your favorite Twitter user on mobile phone? Using mobile apps to follow Twitter activity can be heavy loaded routine for majority of mobile users. 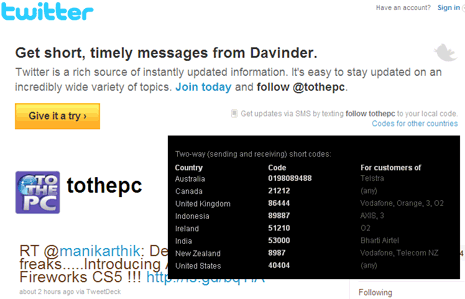 Making things simple and quick – just send a SMS to get updates from any Twitter user instantly in your country. 1. Go to compose message screen on your mobile phone. 3. Send SMS to local number for your country. Australia 0198089488 (Telstra), Canada 21212 (any), United Kingdom 86444 (Vodafone, Orange, 3, O2), Indonesia (89887 AXIS, 3), Ireland 51210 (O2), India 53000 (Bharti Airtel), New Zealand 8987 (Vodafone, Telecom NZ), United States 40404 (any). Love the collection on this site. Visit this site almost everyday, have it in my favorites. For all the readers would like to share a love mobiles.maxabout.com/sms/index.aspx site. Feel it will be useful to you. If you can’t tweet via SMS, try using tweetbymail.com with your mobile email address. It works anywhere in the world. What are the charges of using this service and in India. I heard that Airtel supporting this service. Is any other mobile operator also supports this service?